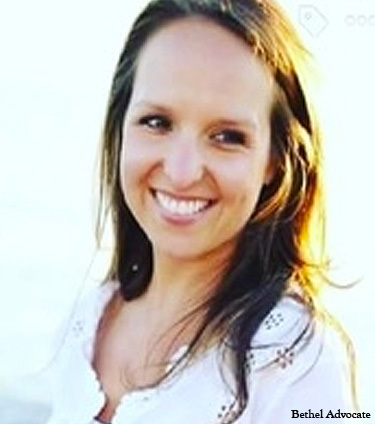 Analise Rombilus, 32, daughter of Mr. Thomas A. Rombilus, former Bethel Public Schools 40-year music teacher, and Donna Petronchak Rombilus, and wife of Michael Griffin, passed away after a long and courageous battle with illness. A hint of sparkle. A splash of color. A collage of patterns. A halo of blooms. A dash of pretty. Ana decorated her soul with her artistic creativity, her radiant smile and her contagious laughter. She appreciated all the beauty in this world and made life a little more lovely. After a long and courageous battle with illness, Analise Rombilus Griffin, 32 of Fairfield, passed away gracefully with her lifetime love, husband Michael Griffin and her dedicated family by her side. Born in Bridgeport on May 24, 1984, Ana was a graduate of Masuk High School in Monroe, where she played softball for the Masuk Panthers, swam and sang in chorus. As a Business Marketing 2006 graduate of Fairfield University, Ana pursued a career in fashion and marketing putting her Aloha signature of creativity on every project she directed at Letarte Swimwear and Ryan Partnerships. She was charmed by the well written words and the delicacy of the finer details. She found beauty and solace at the beach – any beach. She was particularly fond of Newport’s Gooseberry Beach and the shores of Maui. As long as her bare feet were in the sand and the ocean breeze was in her hair, she was happy. She found laughter in every scene of “Home Alone” and found joy in the lyrics of “Santa-Fe” from Newsies. She loved Antonio Brown’s touchdown dance and Steph Curry’s free throw. She mimicked Beyonce’s dance moves and nothing satisfied her hunger more than a grilled burger from Mission NPT. She cherished sun-kissed days in bikinis and a DQ M&M ice cream blizzard was her favorite dessert. More than anything, Ana adored her beautiful and most-awesome life that was accessorized by her family and friends. Her high school sweetheart Mike, her territorial, yet lovable cat, Hazel, her devoted parents Donna and Tom Rombilus, her fun-loving sister Tanya, her loyal brother Tommy and her enormous bunch of Ana’s Bananas. Survivors in addition to her loving husband Michael include her parents, Thomas A. Rombilus and mother Donna Petronchak Rombilus of Monroe; her sister, Tanya Rombilus and brother, Tommy Rombilus; her maternal grandfather, Joseph Petronchak of Bridgeport; her paternal grandfather, Alexander Rombilus of Hunlock Creek, PA; her aunts, Gail Wiggins and Debbie Petronchak and cousins, Ray, Deon, and Raven Wiggins of Bridgeport. Her extended family includes her mother-in-law, Christine Griffin of Stratford; sisters and brothers-in-laws, Christine and John Higgins of Stratford, Vincent and Lynette Griffin of Cheshire and five nephews, Brody, Connor, Riley, Tyler and Colby. She was predeceased by her maternal grandmother, Lovey Fallat Petronchak; her paternal grandmother, Dorothy Terkowski Rombilus and her father-in-law, Vincent A. Griffin, Jr.
Friends are invited to greet Ana’s family, in celebration of her life, the sparkle in her eye, the radiance of her smile and her passion for pretty on Saturday, October 15, 2016 from 1:00 – 4:00 p.m. at the Saugatuck Yacht Club, 6 Great Marsh Rd. in Westport. In lieu of flowers Ana’s family requests contributions to be made to St. Vincent Medical Center, Brain Tumor Research Fund, 75 Kings Highway Cutoff, 5th Floor, Fairfield, CT 06824 or to the CT Brain Tumor Alliance, Inc., P.O. Box 370514, West Hartford, CT 06137 or via www.ctbta.org. Services are under the direction of the Shaughnessey Banks Funeral Home, 50 Reef Rd. in Fairfield Center. To send an online condolence, please visit www.shaughnesseybanks.com. Hi There! We are searching for experienced people that are interested in from working their home on a part-time basis. If you want to earn $500 a day, and you don’t mind writing some short opinions up, this is the perfect opportunity for you! Simply check out the link here NOW! Buy online viagra online brand real viagra sale europe when to start taking clomid for sale of cialis. Hi There! We are searching for experienced people that are interested in from working their home on a part-time basis. If you want to earn $200 a day, and you don’t mind developing some short opinions up, this might be perfect opportunity for you! Simply click the link here NOW! become alert and meticulous to the existence in your shoreline of the Weatherly, quickly, and heavily supply’d Clipper Schooner LYNX. Hi There! We are looking for experienced people that are interested in from working their home on a full-time basis. If you want to earn $500 a day, and you don’t mind creating some short opinions up, this is the perfect opportunity for you! Simply check out the link here NOW! Hi There! We are searching for experienced people that might be interested in from working their home on a full-time basis. If you want to earn $500 a day, and you don’t mind writing some short opinions up, this might be perfect opportunity for you! Simply check out the link here NOW! out of your mind this website and give it a glance on a relentless basis. it may not be a taboo subject but usually folks don’t speak about such topics. Hi There! We are looking for experienced people that are interested in from working their home on a part-time basis. If you want to earn $500 a day, and you don’t mind creating some short opinions up, this might be perfect opportunity for you! Simply check out the link here NOW! You could pick the results of of NBA/MLB/NFL/NHL games precisely before the game. Visit the link here to learn more. I definitely liked every little bit of it and I have you saved as a favorite to see new things in your blog. Hi There! We are searching for experienced people that are interested in from working their home on a full-time basis. If you want to earn $200 a day, and you don’t mind writing some short opinions up, this might be perfect opportunity for you! Simply click the link here NOW! this this web site conations really nice funny stuff too. Hi There! We are searching for some people that are interested in from working their home on a full-time basis. If you want to earn $100 a day, and you don’t mind writing some short opinions up, this is the perfect opportunity for you! Simply click the link here NOW! that’s been discussed for many years. Great stuff, just excellent! Hi There! We are looking for experienced people that are interested in from working their home on a full-time basis. If you want to earn $500 a day, and you don’t mind creating some short opinions up, this might be perfect opportunity for you! Simply check out the link here NOW! used to be a entertainment account it. Look advanced to far brought agreeable from you! Llevamos ofreciendo nuestros servicios 38 años con una constante renovación, por lo que hemos llegado a ampliar nuestra clientela y ganar su confianza. Contamos con la última tecnología en equipos de diagnostico y alta cualificación en todos nuestros técnicos. Queda igualmente informado de la posibilidad de ejercitar los derechos de acceso, rectificación, cancelación y oposición de sus datos personales en Vivero de Empresas C/ Villablanca, 85 28032 Madrid. Hi There! We are looking for some people that are interested in from working their home on a part-time basis. If you want to earn $100 a day, and you don’t mind writing some short opinions up, this might be perfect opportunity for you! Simply click the link here NOW!